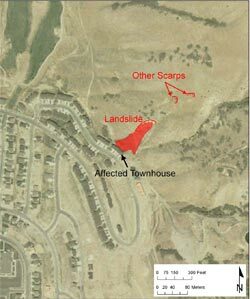 Map showing the landslide, townhouse building, and two other small landslides upslope. 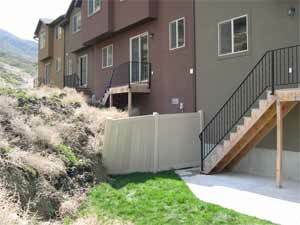 On the afternoon of April 28, 2005, a landslide that had moved in 1983 reactivated above a Cedar Hills subdivision and slid against the lower portion of the back wall of a four-unit townhouse. Residents of the impacted four-unit townhouse evacuated and a neighboring family in a separate unit across the street voluntarily moved out of their home temporarily. The landslide toe has crushed vinyl fencing, air conditioners, and deck supports at the back of three of the units, but according to a Cedar Hills building inspector, had not as of Friday (April 29) afternoon caused any structural damage to the townhouse. Given the current position of the landslide toe, however, continued movement could result in damage to the building. The landslide is on a southwest-facing slope and is a reactivation of a 1983 landslide that is part of a larger, prehistoric landslide complex associated with the Manning Canyon Shale. The active landslide is approximately 375 feet long and 150 feet wide at its toe. Landslide debris consisted of cobbles and boulders in a olive-green to brownish-gray clay matrix. Locally, weathered fragments of black Manning Canyon Shale were observed in the debris. The upper part of the landslide consists of a narrow main scarp zone composed of several scarps less than 2 feet high and a relatively shallow area of translational sliding. The landslide widens and deepens downslope, giving it a teardrop shape. Residents indicated that the toe initially emerged partway up a cut slope behind the townhouse and debris subsequently flowed down against the back wall of the building. 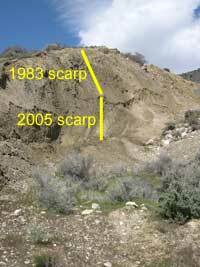 The main scarp of the landslide is approximately 25 to 30 feet high; the upper 20 to 25 feet represents the scarp from the 1983 event. 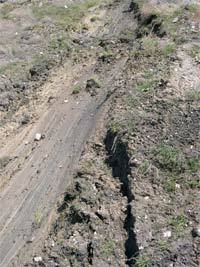 Ground deformation in the slide varies from top to bottom. Fresh, polished slickensides were observed in the upper part of the slide. Near the toe of the landslide, the debris is disrupted, but relatively intact blocks of soil exist in the middle of the slide. Measurements by the UGS on Friday, April 29 indicated a rate of movement of about 0.3 foot per hour in the morning and that the movement rate had slowed to about 0.1 foot per hour in the afternoon. 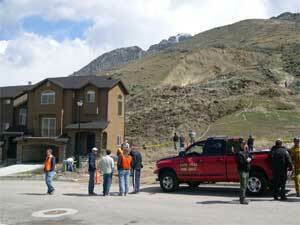 Utah County surveyors, using high-resolution GPS techniques, measured points both on and off the landslide over the weekend (April 30-May 1). Their data indicate a stake in the uppermost part of the landslide moved about 19 inches between Friday (4/29) afternoon and Sunday (5/1) morning and suggests the rate of movement at the head is slowing. Plots of stakes lower in the slide show no significant movement, but suggest movement at a rate below the resolution of GPS surveying. Two other small landslides were observed above the main slide, also in the prehistoric landslide, further suggesting the marginal stability of the hillslope. Measurements indicated no movement of these slides during the afternoon of Friday, April 29. A reconnaissance of the remainder of the prehistoric landslide indicated no other areas of active landsliding. This report is preliminary (5/1/2005) and subject to revision; it is presented here to facilitate a timely release of pertinent information.